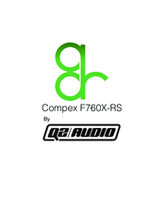 Compex F760X-RS - audiolounge-pros Webseite! by top engineers as the quintessential box for larger-than-life drum sounds! The ADR Compex F760X-RS may be the best compressor/limiter available for drum room mics and drum bus duties and is also highly sought-after for the character and punch it adds to guitars along with a myriad of other sources... And now it can be yours! The ADR Compex F760-RS by Q2 Audio reintroduces, at long last, the venerable and highly sought-after dynamics processor of yesteryear. The unique character and spirit of the Compex can be heard on many classic recordings (think of that huge, commanding drum sound on When the Levee Breaks by Led Zeppelin, for instance). With painstaking attention to detail, Q2 Audio has masterfully reproduced the exact circuit design of the original Compex, with a handful of new features and updated components. Functionally, the new Compex has all the same features and settings as the original unit, employing the same super-flexible FET-based compression, limiting and gating. Switchable threshold, compression ratio, and attack/release times are available with all the same settings and a stereo link switch is provided for linking the two channels together for operation in stereo. An all-new external side-chain insert has been added to the new Compex, letting you feed the detector circuit of the compressor with an independent sound source. The side-chain insert can be set to control the gate circuit, instead, by simply switching over an internal jumper. The limit section has a switchable 50us "pre-emphasis" setting in addition to the normal “on” position. Pre-emphasis was originally used for limiting high frequencies to prevent over-modulation during broadcast use. Pre-emphasis boosts the high frequencies entering the limiter side-chain, acting as a de-esser causing limiting action on sibilant high frequencies. The compressor side-chain insert is useful for adding an EQ to the side-chain audio signal to create "vocal stresser" type frequency-dependent compression effects or inserting another audio source for “ducking". Improving upon some of the components and build-quality concerns of the original Compex, a high-quality meter has been employed (replacing the discontinued Sifam™ Director 14 meter) and the original “ABC” cards have been combined to a single PCB to allow for more efficient manufacturing. Also, some slight alterations have been made to the calibration functions to help the unit maintain calibration over a longer period of time. The original potentiometers were an open frame design which became noisy as time wore on, the re-issue has sealed conductive plastic potentiometers to improve the usable life-span. With a wide range of features and functions, the new ADR Compex by Q2 Audio can meet the needs of any dynamic-processing task, adding a character and flavor all its own. Those familiar with the original Compex will be pleased to see how faithfully recreated this reincarnate really is, with a few enhancements and updates to make one of the best compressor/limiters just that much better. This new version of the classic Compex compressor features Jensen input and output transformers, offering balanced I/O, higher headroom and slightly smoother transient response. Renowned for decades by top engineers as the quintessential box for larger-than-life drum sounds! The ADR Compex F760X-RS may be the best compressor/limiter available for drum room mics and drum bus duties and is also highly sought-after for the character and punch it adds to guitars along with a myriad of other sources... And now it can be yours! The ADR Compex F760-RS by Q2 Audio reintroduces, at long last, the venerable and highly sought-after dynamics processor of yesteryear. The unique character and spirit of the Compex can be heard on many classic recordings (think of that huge, commanding drum sound on When the Levee Breaks by Led Zeppelin, for instance). With painstaking attention to detail, Q2 Audio has masterfully reproduced the exact circuit design of the original Compex, with a handful of new features and updated components. Functionally, the new Compex has all the same features and settings as the original unit, employing the same super-flexible FET-based compression, limiting and gating. Switchable threshold, compression ratio, and attack/release times are available with all the same settings and a stereo link switch is provided for linking the two channels together for operation in stereo. An all-new external side-chain insert has been added to the new Compex, letting you feed the detector circuit of the compressor with an independent sound source. The side-chain insert can be set to control the gate circuit, instead, by simply switching over an internal jumper. The limit section has a switchable 50us "pre-emphasis" setting in addition to the normal “on” position. Pre-emphasis was originally used for limiting high frequencies to prevent over-modulation during broadcast use. Pre-emphasis boosts the high frequencies entering the limiter side-chain, acting as a de-esser causing limiting action on sibilant high frequencies. The compressor side-chain insert is useful for adding an EQ to the side-chain audio signal to create "vocal stresser" type frequency-dependent compression effects or inserting another audio source for “ducking". Improving upon some of the components and build-quality concerns of the original Compex, a high-quality meter has been employed (replacing the discontinued Sifam™ Director 14 meter) and the original “ABC” cards have been combined to a single PCB to allow for more efficient manufacturing. Also, some slight alterations have been made to the calibration functions to help the unit maintain calibration over a longer period of time. The original potentiometers were an open frame design which became noisy as time wore on, the re-issue has sealed conductive plastic potentiometers to improve the usable life-span. With a wide range of features and functions, the new ADR Compex by Q2 Audio can meet the needs of any dynamic-processing task, adding a character and flavor all its own. Those familiar with the original Compex will be pleased to see how faithfully recreated this reincarnate really is, with a few enhancements and updates to make one of the best compressor/limiters just that much better.